These easy, crispy, and delicious homemade potato taquitos are a cinch to make with leftover mashed potatoes, corn tortillas, and a little bit of cheese. When I realized that we are celebrating potatoes this week for Summer Fest, I wasn’t sure where to even begin. Potatoes are so versatile that when I was trying to think of a recipe to write about, I just couldn’t narrow it down. So when my good friend Ruby mentioned on Facebook that she was planning on frying up some Taquitos de Papa for dinner yesterday, I though it perfectly natural to invite myself over for some potato taquitos to celebrate Summer Fest Potato Week. For many people, potatoes mean comfort food. For me, it’s my mom’s Potato Leek Soup and my grandmother’s Mashed Potato Casserole with cream cheese and sour cream. These taquitos stuffed with leftover mashed potatoes and cheese are comfort food for Ruby because her grandmother used to make them for her when she was young. They were absolutely delicious—crisp on the outside, soft and creamy inside. I’m glad I invited myself over for dinner because now I can add Taquitos de Papa to my list of comfort foods as well. So tell me, do any of your favorite comfort foods involve potatoes? What are they? Do you have a favorite way to use up leftover mashed potatoes? In Sicily, we ate tons of crocchette di patate, or potato croquettes – basically just mashed potatoes seasoned with salt and a touch of nutmeg that were formed into little balls or logs, rolled in breadcrumbs, and deep fried. So delicious! I keep meaning to try making them at home, but I never seem to have any leftover mashed potatoes. Here’s another way to use up leftover mashed potatoes. 1. Warm the potatoes and and tortillas before starting - this will make the ingredients easier to work with. Taste potatoes and make sure they are well seasoned. 2. Spoon 2-3 tablespoons of mashed potatoes in the middle of a tortilla. Add a bit of shredded cheese if you are using it then roll it up into a cylinder. Secure with toothpick if it doesn't want to stay rolled. Repeat until you have made as many as you would like. 3. Heat enough vegetable oil in a skillet to come halfway up the sides of the taquitos. You'll want an oil temperature suitable for deep-frying - 350 to 375 degrees F. Fry taquitos in batches until lightly browned and crisp, rolling them over halfway through cooking time to brown both sides. Drain on paper towels. 4. Serve warm with salsa, guacamole, and sour cream. *My friend Ruby's grandmother used to put shredded cheese in them for her, so Ruby makes them that way for her girls. For Fall Fest: Curried Potatoes with Tomatoes and Peas http://purplecook.blogspot.com/2010/08/curried-potatoes-with-tomatoes-and-peas.htmlThe verdict on this dish at our house was, KEEPER! Mashed potatoes with homemade gravy are my ultimate comfort food, with tater tots being a close second. Give me a choice between fries and tater tots, and I'll choose the tater tots every time. I love a good taquito. These are on my 'gotta make!' list. These look so good! And I'm feeling Mexican food these days. In fact, my recipe this week is for Potato and Chorizo Tacos.In learning more about potatoes, I also discovered that they are quite nutritious! My Summer Fest post goes over the nutritional benefits--for us and the kids--and how we can get the most out of potatoes' nutrients. Even more reason to love them!Thanks for another great week. Can't wait to read what everyone else has been making with potatoes! Far too many of my favorite comfort foods involve potatoes! Lots of Indian dishes (my husband is obsessed with aloo gobi), french fries/home fries (best with smoked paprika and fresh cilantro), and I've been working on a vegetarian shepherd's pie that pretty much rocks.As for leftovers, as a kid, my mom used to slice hot dogs in half (haha I know, not even haute cuisine), pile on some mashed potatoes and a slice of cheddar cheese and then bake in the oven until everything was hot and melty and delicious. I'm now a vegetarian, but have been known to do the same thing with sliced squash or tomatoes - really, mashed potatoes and cheese goes pretty well with just about anything. I am pregnant and have been craving potatoes like crazy. I don't know if I'll be able to get these out of my mind until I try them! Oh, and seeing Deborah's comment about craving potatoes reminds me of a fun anecdote -- every time I get to craving potatoes (which is often), I lament about the Ukrainian in me coming through! 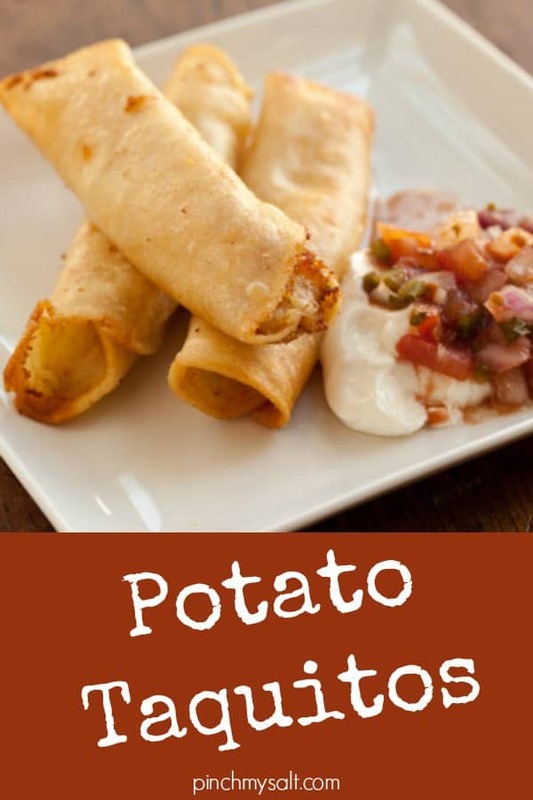 Ok, since I have leftover potatoes from MY Summerfest contribution, you know I am totally making these tomorrow night! i have a 13 year old vegetarian foster son. i can't wait to try these, something we will all enjoy! Potatoes + tortillas makes me think of the opening scene of Big Night. But that'sa two starches! She's a criminal! But they just go so well together. I dare anyone to have a Pete's Kitchen breakfast burrito and not walk away convinced that potatoes and tortillas (corn or flour) weren't made for each other. What an awesome way to use up leftover potatoes. Yum! These look fantastic. Leftover mashed potatoes always seem to go to waste in our house, so this is perfect. Anything with potatoes is a comfort food. :) I like to make mashed potato cakes with my leftover mashed potatoes, and potato soup with my leftover baked potatoes. 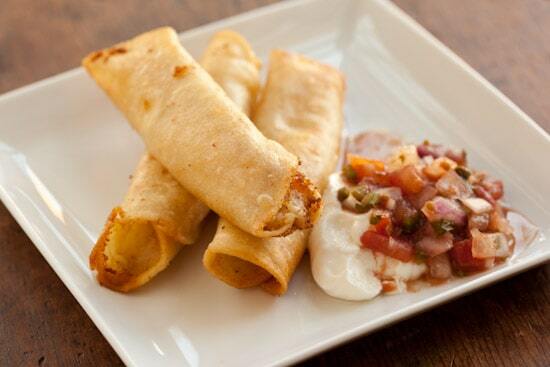 These taquitos look so good- they could easily become one of my favorite comfort foods. This sounds great! Definitely a unique way of using leftover mashed potatoes! I've always been a fan of the classic shepherd's pie, myself! I love this new recipe idea. I live in New Mexico and am *required* to master as much New/Mexican foods as possible (for my lovely spouse who is native New Mexican). That being said, maybe I can impress him with these new, delicious looking taquitos!Secondly, I am NOT in love with all the new advertisements and survey pop-ups I am getting on your blog. This sincerely makes me sad. I have been coming to your site since 2008 (though I don't always find commenting necessary) and intend to continue enjoying your recipes. I understand why people put ads but I just don't think I like the blog as much anymore, because of them.I don't mean to offend anyone; I'm just leaving a comment.